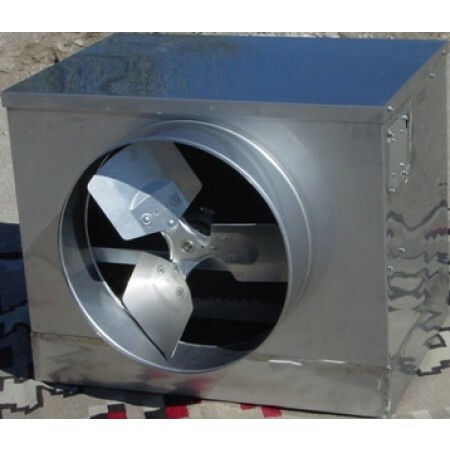 SOUTHWEST SOLAR SOLAR CHILL AIR DIFFUSER 14"
Air Flow 1,000 CFM. This unit uses 38 to 52 watts at 24 volts DC and can be run direct with a 180 watt, 24 volt nominal PV panel, although we recommend deep cycle batteries for best performance. Evaporative cooling uses a system of air flow called the Fresh Air System. In this system, fresh outside air is brought in through the cooler, where it is cooled and pushed through the building, then exhausted to the outside through screened windows or doors. 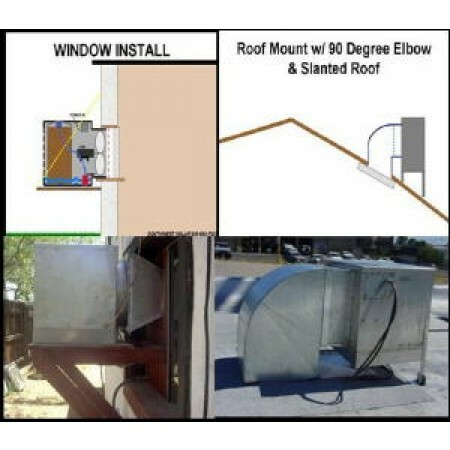 This type of air circulation differs from traditional air conditioning, which uses recirculated air, allowing the same inside air to revolve over and over again through the building, and unlike the the Fresh Air System, works best if it is sealed off from all outside air leakages and exchange. This causes stale and toxic air in your home or office! These problems are known as "sick building syndrome". 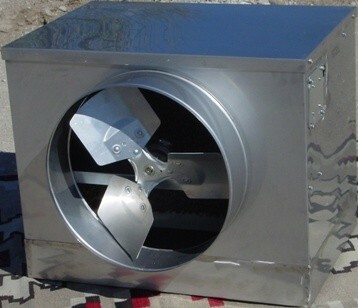 The Fresh Air Cooling System, used by all evaporative coolers, is beneficial as compared to the re-circulation of the AC units, because evaporative coolers are designed to supply an entire exchange of all the buildings air every 2 to 3 minutes. Evaporative cooling greatly reduces environmental air-impurities; while AC units will continue to re-use the same polluted air, often causing problems with indoor air quality. For this system to work well, the windows must be partially opened to allow air to escape, which allows the freshly cooled air to enter. If the windows are closed, the exhaust and intake air will be restricted, and the building will become pressurized and not cool well. The intake of fresh cooled air will be blocked. The rust-proof housings are built of 304 stainless steel and use a new 8" thick fluted pad as the wet cooling media. This pad is the most efficient evaporative cooling media in the world, and it will last five years with minimal maintenance. Optional rheostats may be used to slow fan speed. Optional control packages with cleanout pumps are available. Solar Chill coolers are available for 48-volt DC and 120 or 240 VAC operation by special order. Contact us for pricing. 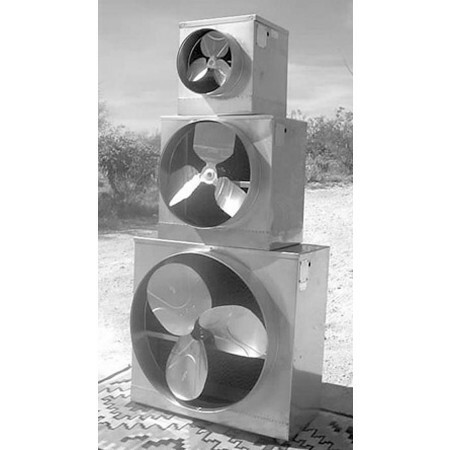 For array-direct operation of evaporative coolers, use an array with at least the recommended watts and choose a linear current booster with the correct amp and voltage rating. 5 years on the stainless steel cabinet, except for electrolysis issues (electricity conducting through the water or cooler cabinet), and one year on the electrical components. Water damage to motor and electronics due to improper operation are not covered. Please contact us if you have any questions, or if there is no shipping weight noted for a shipping cost quote. Prices online subject to change without notice due to supplier price increases. We will contact you if current price is more than the online price prior to processing the order.